Our outstanding ETM magazine has been redesigned from the ground up with input from firearms expert Larry Vickers to include a solid tube construction, redesigned basepad, follower sand cuts for smoother operation in harsh environments and a molded-in last round follower detent to absolutely prevent last round feed failures. This mag has been designed as the last word in military or law enforcement duty magazines for the 1911 platform pistol. The Vickers Duty Mag has a completely sealed construction with rear witness hole that nearly eliminates lip spreading and ingress points for sand and debris. The redesigned follower has sand cuts to reduce friction when dirty or heavily fouled and the new last round detent will solve last round reliability issues in the 1911 design. The baseplate of the Duty mag is uniquely shaped and easy to grab under stress. It is weighted to drop free in any field conditions. The improved follower really does seem like an improvement, and the feed lips appear to be rock solid. Be aware that with these steel basepads your 1911 will no longer fit in the box and will be overweight. I think ill take standard ETM pads and put them on these tubes and innards... Would also love to see this follower and spring available separately as an upgrade to my ETM mags! Wilsons ETM/500 series mags are the best mags on the planet. The ETM Vickers mags are the best mags in the universe. They are a bit pricey, but are worth every penny. Unyielding quality through and through. I like the new follower feature and the enclosed magazine . Hope to see the followers for sale in the near future . Been using Wilson magazines for 13 years now. Didnt hesitate to buy this one either. I love all the new design features Larry Vickers designed for this magazine. Durable, reliable, and functionality are the heart of this magazine. The new gold standard in 1911 magazine​ technology. I finally ordered one of these mags after watching the video and reading the description for months. I was not disappointed in the quality or design, it is everything LAV says. One note for someone on the fence, the base plate is quite a bit longer than the standard ETM mags and 47D so it sticks out of the mag-well pretty far. 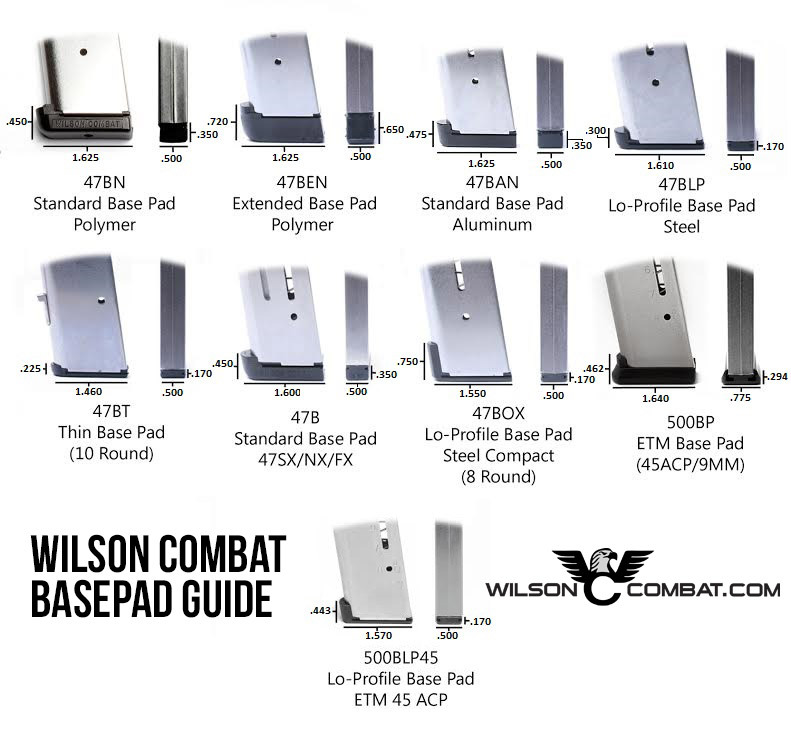 It is interchangeable with other Wilson Combat base plates if you prefer a lower profile for concealed carry. Best 1911 Magazine ever produced!!!! I received a Vickers 1911 ETM-V for use in my Wilson CQB. Upon receipt of the magazine, I noticed that it was a solid built unit. After firing 200 rounds of ammunition using the magazine, it is now my duty weapon. Positive slide locks after the last round. The baseplate makes it extremely easy to seat the magazine and gives a large grip area to grab in case you need to pull the magazine out. I am the department armorer and firearms instructor of my department and I highly recommend this magazine. Been using the Vickers mags in training and LOVE the new basepad...really helps me grab the mag under stress! Thanks WC!